Responding to the announcement on Friday, OPSEU President Warren (Smokey) Thomas pointed out that Hudak just turned three million voters against him. It’s hard to believe the PCs have a hidden agenda when their leader is so willing to put his extreme views out there for all voters to examine. What got missed in all the incredulity and analysis of such a massive cut in public sector jobs – nearly eight times what Mike Harris had promised to slash – was who Hudak would carve out from the devastation: doctors, nurses and police. Doctors and nurses? Does Hudak not realize that health care is made up of hundreds of professions such as medical laboratory technologists, physiotherapists, pharmacists, respiratory therapists, and x-ray technologists, to name but a few? Did Hudak also just forget that personal support workers make up the largest constituent profession in home care? What about all the workers who provide clinical support? 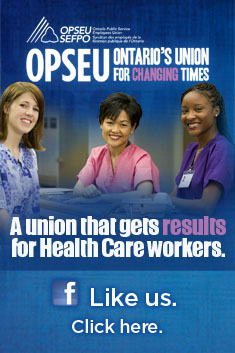 Does Hudak envision doctors and nurses personally setting up surgical appointments, for example? How does the PC leader promote the notion that better health care is team-based when he can’t even acknowledge there is a rest of the team? We’re told he would not cut health care — not just lasso doctors and nurses — but parsing an election pledge into any kind of detailed analysis is like trying to build a house based on a child’s drawing of one. The current provincial government says it is not cutting health care either – but the funding is clearly below the cost pressures of inflation, population growth and aging. To be fair, we don’t know what the NDP’s position is yet on health care funding. If Hudak is to be true to his word on public sector cuts, there will be increased pressure on the health system given its direct impact on the social determinants of health. Is Hudak planning on factoring that in? Last week we reported on Jim Stanford’s analysis that Hudak’s rushed plan to balance the budget would eliminate 165,000 jobs in Ontario. It’s almost like Hudak read the Unifor economist’s analysis and decided to confirm it on Friday. Given every dollar of public sector spending results in $1.50 of economic activity (public sector workers spend their money on goods and services like everyone else), that would place at least another 50,000 private sector jobs on the line. Given other proposed cuts the job losses could potentially go much higher than the 165,000, especially if the government is looking to make room for more corporate tax cuts. Over the weekend Hudak pledged to cut corporate taxes from 11.5 per cent to 8 per cent. Former Finance Minister Dwight Duncan had already started the descent by creating the lowest corporate taxes in the region. It’s fair to ask where all the jobs are that were supposed to follow? By now we all know what the business sector did with that premium: nothing. Canada’s corporations are sitting on nearly $600 billion in “dead money” — cash that is not being used to create jobs, reinvest in technology, or even pay out to shareholders. Former Bank of Canada governor Mark Carney said in 2012: “their (corporations) job is to put money to work and if they can’t think of what to do with it, they should give it back to their shareholders.” Why would we want to give them more? It’s interesting to note that the Federal government has initiated four by-elections to take place June 30. That didn’t include Jim Flaherty’s Whitby riding. The media are suggesting that Stephen Harper may be holding the seat for Christine Elliott, who may want to depart Queen’s Park shortly after June 12. Can you really blame her? The man who wishes to be Premier has had a hard start to his campaign. The daily blunders range from running away from the press after a botched recording studio media event to yesterday’s aborted press conference aboard a TTC subway train (they neglected to seek permission). If his party can’t organize a simple media event, how can it run a $130 billion provincial government? If you liked this story, please share it with others. Use the “share” button below. Watch tomorrow for coverage of Dr. Danielle Martin’s speech this evening at the Isabel Bader Theatre. This entry was posted in Uncategorized and tagged Christine Elliott, Ontario PC Platform, Tim Hudak. Bookmark the permalink. Don’t get me wrong. I have a positive opinion of civil servants and of unions in general. But the rash statement by Mr. Thomas that three million public servants now have a reason to vote against Mr. Hudak was ill-advised. I believe that this point cannot be overstated. Very often, union members don’t perceive the level of dislike or jealousy for their organizations that exists within public opinion. Making a statement that refers to the existence of a large costly number of them within the public service will only serve to feed the union hatred that Hudak and other libertarians within our various conservative parties are constantly attempting to exploit. Many perfectly reasonable people within the public do not understand the importance of unions and see them only as the representation of a special interest and often as a selfishly disruptive influence. Except on a one-to-one personal basis, I have had little success in changing this attitude when I have encountered it. There aren’t anywhere near three million public sector workers — let alone public servants. Smokey was referring to the greater impact on the public sector, including families who may suddenly see an income disappear. In fact, Hudak’s estimates are wrong. At best he can control employment for about 800,000 — not a million. He’s carved out health care, so the pool from which to cut jobs is even smaller. Even if you are fortunate to avoid the cuts, the impact on the workplace will be enormous. It’s guaranteed the work will not disappear with those who have been contributing their effort. Further, the impact on municipalities could cause them to raise taxes to make up for the lost provincial share. Will three million Ontarians now have a reason to vote for a party other than the PCs? I think any objective person would say yes.